as a tattoo this week and ive tried to but it in tengwar quenya italic by myself but its simply not right can you please help me out? Hahaha I checked your transcription I just had to make sure! You're right, it is a pretty reckless to just wholeheartedly trust a stranger on the Internet with something so permanent. then again, I don't think it's possible to be 100% sure (it IS fictional after all!) so the least we can do is to make sure it's as accurate as possible! And Merry Christmas to you too! Have a great one! Stephaniet18 wrote: Hahaha I checked your transcription I just had to make sure! You're right, it is a pretty reckless to just wholeheartedly trust a stranger on the Internet with something so permanent. then again, I don't think it's possible to be 100% sure (it IS fictional after all!) so the least we can do is to make sure it's as accurate as possible! Well done ! And you're right, we can't be 100% sure, as Tolkien is dead... But I'm 100% sure that if he wasn't, he would be able to read all what I right very well. BTW I saw the two new requests (Melethiel's et Sreb's)... I'm in a Christmas rush, but I should be able to do them for Friday. Sreb, it would be better to precise the language in which this is, because if I guess wrong, the result will also be wrong ! Last edited by Melethiel on Wed Dec 21, 2011 6:37 pm, edited 1 time in total. Comme promis, je viens faire mon tour dans ton domaine pour te demander une nouvelle fois ton aide si précieuse. J'aurais une demande de transcription pour une nouvelle idée de tattoo que j'ai eue récemment! Par contre, j'ai lu que tu es bien occupée ces temps-ci avec le temps des fêtes -- et je tiens à te dire que ma demande ne presse pas du tout. Sens-toi à l'aise de ne pas te dépêcher pour la faire si tu manques de temps ou si d'autres demandes sont plus pressantes! Grosseur: à peu près comme ça & serait-il possible que tu me fournisses aussi les codes, pour que je puisse changer la grosseur en cas de besoin? Comme tu peux voir, il s'agit de deux phrases, chacune avec trois mots différents à la fin. Je ne sais pas comment tu t'arranges normalement avec ce genre de demande, mais pas obligé de faire les six au complet si tu as une méthode plus rapide qui fonctionne! Dhani, ne t'inquiète pas ! Oui, je suis dans le rush, mais les fériés s'en viennent et j'aurai tout clairé sous peu, en fait dès que j'ai une petite demi-heure devant moi, donc ce vendredi ! Merci par contre de préciser que ça urge pas, ça aurait pu m'aider dans d'autres circonstances ! Si seulement tout le monde avait des requêtes aussi complète que la tienne... ! Et pour les 6 variantes, etc., les seules expressoins qui me viennent sont de l'ordre de "les deux doigts dans le nez"... J'aime bien la fonction "copier-coller", qui est très pratique dans ces cas alors t'inquiète pas encore une fois, tu auras les transcriptions et les codes pour chacun, c'est pas plus long et pas plus compliqué, et ce sera le même prix ! Hi Isildilmë, sorry to be a pain! But is there any chance I could see it in Tengwar Annatar Italic Bold too? please! And you'll make me blush again with your praise ! I'll end regretting I gave you gibberish instead of a real transcription ! Just kidding ! Edti : oh ! And a very merry Christmas to both of you too ! And hence, I'm LOVING the design I'm working up for this tattoo, so even if we split one day (*touches wood*) I think I could still keep it and be happy with it, but I just couldn't get his name put on me... no matter how much I adore him. My son however, will ALWAYS be my son, no matter what! Here's the sentence: "Eru tortha i vanadh nîn"
and I want a transcription into Tengwar and I want it written in Sindarin. And i'd like the Tengwar Sindarin font. The Italicized style! flyingduster, how cool is that ! If you want my opinion, with the shadow there is a little plus... because if you leave a space between the shadow and the letters and line, they will appear like glowing... in my tattoo we did that and I love it, really... but this is my opinion, and that doesn't mean you have to follow it !!! For Gladhaniel : Moi qui m’attendais à une requite en allemand de toi, j’ai été surprise ! Quoi que, pas tant que ça, vu les freeks que nous sommes. Je te l’ai fait d’une grosseur semblable à ce que tu as demandé (je crois que c’est en fait un poil plus gros, mais c’est presque imperceptible ! ), et je t’envoie les codes à l’instant par courriel. Ohlàlà, c'est totalement magnifique! Mille mercis pour ton aide, j'apprécie énormément. Eh bien, j'ai repensé à la discussion que nous avions déjà eue à propos de la signification que les langues ont pour nous, et des effets ou émotions qu'elles inspirent; et je me suis dit qu'après tout, le Quenya était la meilleure langue pour exprimer ce que les mots signifient dans mon coeur. J'adore l'allemand, mais c'est une langue que j'associe plus à un aspect concret et pratique, ce qui ne fonctionne pas pour mes lignes. De toute façon, je sais que c'est mon année en Allemagne qui est derrière les mots, alors côté "référence" ça ne change pas grand-chose. Pour ce qui est du Na'vi, oui, je me souviens avoir déjà vu une demande de transcription autre part sur internet! Ça m'avait vraiment surprise. C'est certain que ça serait à considérer.. Je vais garder ça en tête. P.S. Merci beaucoup aussi pour les codes envoyés par email! Thank you so much! But I have ONE more question. What is "Mode of Beleriand"? Sorry Just curious. Oh my gosh it's so cool Le hannon! Spent hours looking at your translations love it. "No one has greater love than to lay down his own life for his friends." Last edited by jnrkwesi89 on Mon Dec 26, 2011 6:36 am, edited 1 time in total. I've always wanted to get a couple of tatoos in TENGWAR so I was wondering if you could translate a couple for me. Could you please mention the language of each of those names, so that Isildilmë can easily find the appropriate transcription mode? Hey there Isildilmë! Fisrt of all, Merry Christmas, wish you the best! I spent quite a lot of time on the internet searching for some kind of "translator" to do my tattoo, and you seem to be one of the few people who does that kind of stuff, so THANKS! 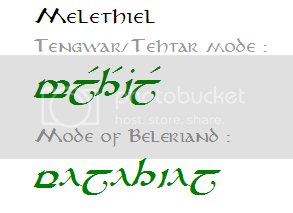 so I was just wondering if you could translate the following for me into the font "tengwar sindarin-normal" and they are all english quotes/words..THANKS! Your help is much appreciated, Thankyou in advance! I've been searching every where and i just cant find what im looking for do you think you could help me out?? Im wanting the zodiac Star signs translated..
AdventureTimeSUP wrote: Thank you so much! But I have ONE more question. If my reading are right, at the beginning Sindarin was written with Cirth (the origins of the Runes latter used by Dwarfs). Then they decide to use Tengwar, even if in some writings we can still find Cirth. In Tengwar, the Mode of Beleriand would be the original and ancient mode, used by the Elves to write Sindarin. As an example, the inscriptions on the Gate of Moria are written with this mode, and normally it should be the one used at Imladris. The Tengwar/Tehtar mode (also called “classic mode”, or “Mode of Gondor”) would be the modern version used at Minas Tirith and by Men. jnrkwesi89, thanks for your giving that time to my work I'll be happy to help you. Same for FerMorilla, merry Christmas too ! I'm sorry for your bunny... I know how it feels... And for hailaliah, no problem as well. SashaaNikora, do you want me to treat these as English words ? I just saw that there are a couple of mistakes in your sentence, but I don't know if you really want it that way (I can do it) or if you prefer to correct it before ! For example, I guess you mean "friends" instead of "frends" and "your" instead of "ure"... just tell me if you prefer your phonetic version... maybe there is a reason why you write them this way and I respect that ! if it's because your language is not English, than you can also tell me what is your language and what is the quote in your language, so I may transcribe it directly into Tengwar.